The Experimental Archaeology Field Course has been one of the highlights of the UCL Institute of Archaeology's undergraduate degree since 1982. At the end of their first week, all first-year archaeology undergraduates spend four days camping in West Sussex while taking part in a number of activities using technologies from the past. 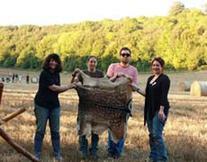 The field course includes a number of activities used commonly in history, such as metal smelting, flint knapping, spinning and weaving, deer butchery and crop processing. The course - colloquially referred to by its former name 'PrimTech' (for Primitive Technology) - also helps the new students to develop friendships within the first week of their degree. Through their direct involvement with the tools and materials used in the past, the students can develop an understanding of what evidence archaeologists may have to interpret the behaviour of ancient peoples. All of these activities help to provoke discussion and debate out of the students' physical experiences. Feedback from previous students has been very positive, with one Archaeology student saying: "It's a brilliant course and I would go again." Another participant explained: " It was great to get to know my fellow first years but on top of that, the presence of the third years and staff made me feel more integrated into the department." This course is a unique way to start an undergraduate degree, introducing students to issues and concepts that lie at the heart of the discipline in an engaging but challenging way. It also contributes to the community spirit that characterises the UCL Institute of Archaeology. As part of the Institute of Archaeology's 75th anniversary celebrations, a mini 'Experimental Archaeology Course' will be held in Gordon Square gardens on Saturday 9 June 2012 with experimental techniques and demonstrations on offer.